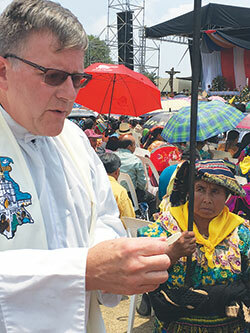 Father Michael O’Mara, pastor of St. Gabriel the Archangel Parish in Indianapolis, distributes Communion during the April 27 Mass celebrating the 50th anniversary of the Quiche diocese in Guatemala. For Father Michael O’Mara, a trip to Guatemala earlier this year became an opportunity to connect St. Gabriel the Archangel Parish in Indianapolis with its sister parish in that Central American country. As pastor of St. Gabriel, Father Michael O’Mara traveled to the Colegio Rosario in Santa Cruz, in the Quiche region of Guatemala, in late April to witness the eucharistic celebration of the 50th anniversary of the Quiche Diocese. Father O’Mara attended the April 27 liturgy thanks to an invitation from Quiche’s Shepherd, Bishop Rosolino Bianchetti. Ten thousand people gathered for the celebration of the mission of the Church in northern Guatemala. Father O’Mara, who is fluent in Spanish, was invited to share his testimony of the mission of this diocese at the vigil, attended by approximately 3,000 people. The reason for this honor dates back to 2015. In January of that year, five members of St. Gabriel Parish traveled to Guatemala to explore the possibility of developing a sister relationship with Our Lady of Guadalupe of the Martyrs Parish in Chel, Quiche, which borders Mexico. They visited the quasi-parish, which includes 24 communities in the rugged mountains of northern Guatemala. “We were received with love and affection by these beautiful people of Mayan descent,” said St. Gabriel parishioner Clare Bain, who accompanied Father O’Mara along with several other parishioners. “It was a profound experience of unity to celebrate the Eucharist in their very humble chapels with tin roofs and often having only dirt floors. St. Gabriel parishioner Charles Braganza also remarked on the joy he witnessed in the community. The missionaries heard story after story of the violence that occurred in Guatemala from 1960-96. The army suppressed an uprising by torture and by burning entire villages and crops. Thousands were massacred as the indigenous Mayan descendants sought better living conditions. St. Gabriel and Our Lady of Guadalupe of the Martyrs parishes are now in their third year as sister parishes. Through the generosity of its parishioners, the Indianapolis parish has been able to sponsor two major projects. The first was the purchase of the Centro Educativo Mixto Bilingüe Intercultural (Intercultural Mixed Bilingual Educational Center), which is a small parcel of land and three small buildings that are used for education of the local people. The second project was the rebuilding of the chapel in Ilom, one of the 24 communities that comprise the parish. The community of Ilom, like Chel, was burned to the ground during the period of violence. The loss of the chapel in the 1990’s came at a time when the area was aggressively proselytized by evangelical churches from the United States. There are now more than 20 evangelical churches in this village of 2,500 people, but only seven Catholic families. By rebuilding the chapel in Ilom, the Church seeks to revive its presence and reclaim its sheep. The celebration included the confirmation of 16 young people from various villages around Ilom. Bishop Bianchetti, the parish’s pastor and the local Catholic coordinator of Ilom, thanked the people of St. Gabriel for supporting this project and the twinning parishes’ efforts. St. Gabriel Parish is also planning a pilgrimage to Oklahoma City for the Sept. 23 beatification of Father Stanley Roether, who was slain as a martyr on July 28, 1981, in Santiago Atitlan, Guatemala, where he was a missionary. He will be the first U.S.-born person to be beatified.